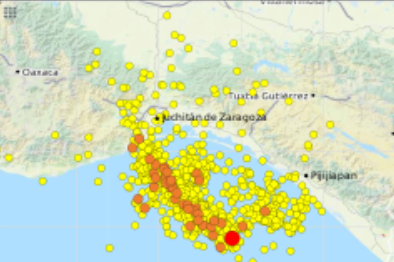 Since the 8.1R earthquake in Oaxaca, we have counted 168 earthquakes of >4R. There has been more than 2,000 aftershocks following the 8.2-magnitude earthquake that hit Oaxaca and other Mexican states, Oaxaca governor Alejandro Murat said yesterday. The emergency in Oaxaca has passed, but aftershocks of the huge tremor that caused nearly a hundred dead and great destruction continue, Murat said in a television interview. He pointed out that basic services such as electric power and water were restored in that territory and the count and evaluation of damages continued, particularly in homes.